Many churches study the book of Acts in various classes. I thought I might begin a series of brief blogs using at least one photo for each chapter in Acts. We will not run these photos daily, but one or two a week. The photos normally will be 800 pixels wide — wide enough for use in PowerPoint presentations. It will be best to leave some space around them. This will allow room for an identifying caption. There is no need to write for permission to use these photos for educational, non-commercial, purposes. I would appreciate a comment or note telling me how you used the material. The promise to the 11 apostles that they would be baptized with (in) the Holy Spirit (1:4-5; Cf. John 14-16). Jesus’ restatement of the Great Commission (1:8). The ascension of Jesus from the Mount called Olivet (1:9-12). In the Gospel, Luke says the ascension took place at Bethany (Luke 24:50). Bethany is on the eastern slope of the mountain. 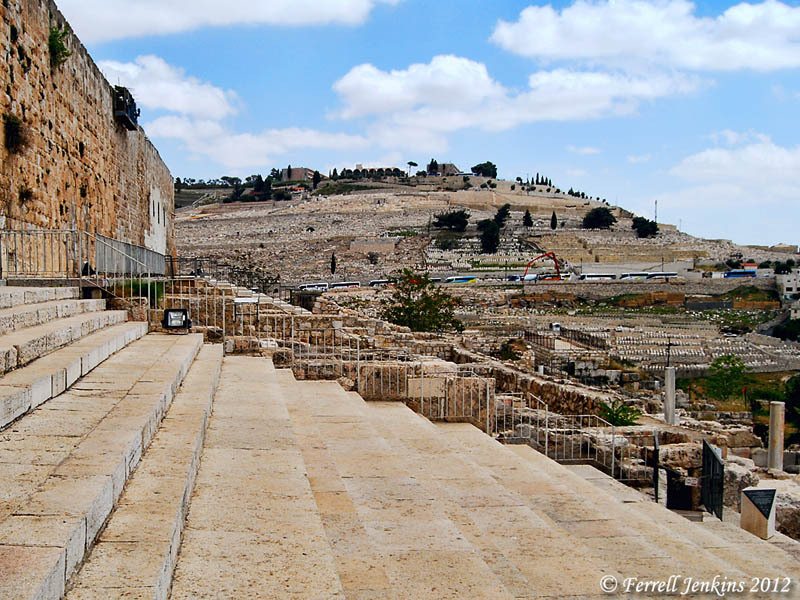 The photo shows the western slope of the Mount called Olivet from the steps on the southern end of the Temple enclosure (precinct) built by Herod the Great. The Mount called Olivet from the Temple Mount. Photo by Ferrell Jenkins. The meeting of the 11 apostles in the upper room (1:13). The record of the death of Judas (1:16-20). The selection of Matthias to replace Judas (1:20-26). This entry was posted in Bible Places, Bible Study, Israel, New Testament, Photography, Travel and tagged Book of Acts. Bookmark the permalink. Luke wrote his Gospel and the Acts of the Apostles states “Therefore, since I myself have carefully investigated everything from the beginning, it seemed good also to me to write an orderly account for you, most excellent Theophilus,” (Luke 1:3 NIV). As in your post you raised this point, I wanted to do our readers think. Because of” the one hand, he writes: “Then he led them out as far as Bethany, and lifting up his hands he blessed them.” (Luke 24:50 ESV) and the other, he said: “Then they returned to Jerusalem from the hill called the Mount of Olives, a Sabbath day’s walk* from the city. * That is, about 3/4 mile (about 1,100 meters)” (Acts 1:12 NIV). Knowing that Bethany is distant from + / ​​- 1.7 miles. (2,800 mètres) (Joh 11:18, ftn) from Jerusalem, beyond the precept therefore enacted by the rabbis. You who have been on site several times, you could say more, and that is what is interesting. I would prefer you limit the comments on my blog to short ones. Write your own views on your blog. I don’t have time to respond to every question that is raised, but will try to make some comments on the Sabbath Day’s journey. Thanks. My post on “What was a “sabbath day’s journey”?” is gone, is this normal?